Strategy game that represents warfare realistically. "Wargamer" and "wargaming" redirect here. For the website, see Wargamer (website). For other uses, see Wargaming (disambiguation) and War game (disambiguation). A wargame is a type of strategy game that simulates warfare realistically, as opposed to abstract strategy games such as chess. A wargame does not involve the activities of actual military forces, which is better called a field training exercise. Likewise, the term "wargame" should not be applied to sports such as paintball. Wargames are not a reliable tool for predicting how a commander might react in a hypothetical scenario that he has never faced in the field. There is substantial literature in psychology that shows that humans are bad at predicting how they'd react in hypothetical situations (especially when it comes to fear), although wargames do deliver somewhat more reliable predictions than pure thought experiments. Generally, wargames can give hints as to how a commander might react, and these hints could be explored and tested through other methods. Wargames on their own are not suitable for proving or disproving technical or tactical theories. Wargames have much more utility as training tools, and some military experts contend that that's all they're good for. Wargames are good for training students to respond correctly in a situation which is known to provoke bad decisions. For this purpose, it is not necessary for the wargame to be highly realistic, it must at least be convincing enough that when the commander encounters the real situation in the field, it will be familiar to him and his trained response will be triggered. Wargames can train students on how to better apply abstract principles of warfare in actual battlefield conditions. A professional wargame is one that is employed by a military for the purposes of training or research. A recreational wargame is played for pleasure, generally by civilians. While a wargame does not involve the activities of actual military forces (that is what the military prefers to call a field training exercise), military command and associated staff may operate in a physical command and control center and execute their decision-making as if the simulation were real. A wargame must at least involve one human player, otherwise it's a mere simulation. Although wargames are adversarial, a wargame need not have clear victory conditions, nor does it have to give each player a fair chance of winning. This is common in military wargames, which are primarily for research and training, not competition. Real-world conflicts, after all, are rarely fair and do not always have clear winners and losers. By contrast, recreational wargames are typically designed for competitive play and are structured around fairness and clear victory conditions. A wargame must have a setting that is based on some historical era of warfare so as to establish what armaments the combatants may wield and the environment they fight in. A historical setting accurately depicts a real historical era of warfare. Among recreational wargamers, the most popular historical era is World War 2. Professional military wargamers prefer the modern era. A fantasy setting depicts a fictional world in which the combatants wield fictional or anachronistic armaments, but it should be similar enough to some historical era of warfare such that the combatants fight in a familiar and credible way. For instance, Warhammer Age of Sigmar has wizards and dragons, but the combat is mostly based on medieval warfare (spearmen, archers, knights, etc.). A wargame's scenario describes the circumstances of the specific conflict being simulated, from the layout of the terrain to the exact composition of the fighting forces to the mission objectives of the players. Historical wargamers often re-enact historical battles. Alternatively, players may construct a fictional scenario. It is easier to design a balanced scenario where either player has a fair chance of winning if it is fictionalized. Board wargames usually have a fixed scenario. A wargame's level of war determines to the scope of the scenario, the basic unit of command, and the degree to which lower level processes are abstracted. At the tactical level, the scenario is a single battle. The basic unit of command is an individual soldier or small group of soldiers. The time span of the scenario is in the order of minutes. At this level, the specific capabilities of the soldiers and their armaments are described in detail. An example of a tactical-level games is Flames of War, in which players use miniature figurines to represent individual soldiers, and move them around on a scale model of the battlefield. At the operational level, the scenario is a military campaign, and the basic unit of command is a large group of soldiers. At this level, the outcomes of battles are usually determined by a simple computation. At the strategic level, the scenario is an entire war. The player addresses higher-level concerns such as economics, research, and diplomacy. The time span of the game is in the order of months or years. Flames of War is a tactical-level historical miniature wargame that simulates land battles during World War 2. TACSPIEL is an operational-level military wargame developed in the 1960s by the US Army for research into guerilla warfare. Hearts of Iron IV is a strategic-level computer wargame set in the mid-20th century. Wings of War is tactical-level historical wargame that simulates World War 1 aerial dogfights. Star Wars: X-Wing is a fantasy wargame whose rules are based on Wings of War. No wargame can be perfectly realistic. A wargame's design must make trade-offs between realism, simplicity, and fun; and function with the constraints of its medium. Military wargames need to be highly realistic, because their purpose is to prepare officers for real warfare. Recreational wargames only need to be realistic to the degree that the players can suspend their disbelief—they need to be credible, if not perfectly realistic. Fantasy wargames arguably stretch the definition of wargaming by representing fictional or anachronistic armaments, but they may still be called wargames if they resemble real warfare closely enough. For example, Warhammer Age of Sigmar has wizards and dragons, but the bulk of the armaments are taken from medieval warfare (spearmen, knights, archers, etc.). Whereas the rules of chess are relatively simple, wargames tend to have very sophisticated rules. Generally speaking, the more realistic a wargame seeks to be, the more complicated its rules must be. This makes wargames difficult to learn. Even experienced wargamers usually play with their rulebook on hand, because the rules for most wargames are too complex to fully memorize. For many people, the complexity also makes wargames difficult to enjoy, but some players enjoy high realism, so finding a balance between realism and simplicity is tricky when it comes to recreational wargames. One way to solve the problem of complexity is to use an umpire who has the discretion to arbitrate events, using whatever tools and knowledge he deems fit. This solution is popular with military instructors because it allows them to apply their own expertise when they use wargames to instruct students. The drawback of this approach is that the umpire must be very knowledgeable in warfare and impartial, else he may issue unrealistic or unfair rulings. Another way to address complexity is to use a computer to automate some or all of the routine procedures. Video games can be both sophisticated and easy to learn, which is why computer wargames are more popular than tabletop wargames. Every wargame must have a sense of scale, so that it may realistically simulate how topography, distance, and time affect warfare. Military wargames typically aim to model time and space as realistically as is feasible. 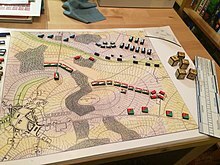 Recreational wargame designers, by contrast, tend to use abstract scaling techniques to make their wargames easier to learn and play. Tabletop miniature wargames, for instance, cannot realistically model the range of modern firearms, because miniature wargaming models are typically built to a scale ratio between 1:64 and 1:120. [a] At those scales, riflemen should be able to shoot each other from several meters away,[b] which is longer than most game tables. If model soldiers could shoot each other from opposite ends of the table, without the need to maneuver, the game would not be much fun. The miniature wargame Bolt Action solves this problem by reducing a rifle's range to 24 inches, a sub-machine gun's range to 12 inches, and a pistol's range to 6 inches. Even if these ranges are not realistic, the proportions make intuitive sense and thus keep the game somewhat credible, all the while compressing the battle to fit the confines of the table. Also, the ranges are multiples of 6, which makes them easier to remember. In real warfare, commanders have incomplete information about their enemy and the battlespace. A wargame that conceals some information from the player is called a closed game. An open wargame has no secret information. Most recreational wargames are open wargames. A closed wargame can simulate the espionage and reconnaissance aspects of war. Military wargames often use umpires to manage secret information. The players may be forced to sit in separate rooms, and communicate their orders with the umpire in the game room, who in turn reports back only the information he judges the players should know. Some recreational wargames use an umpire too, often referring to them as "the GameMaster" (e.g. Warhammer 40,000: Rogue Trader). The fog of war is easy to simulate in a computer wargame, as a virtual environment is free of the constraints of a physical tabletop game. A miniature wargame, set in Ancient Greece. Miniature wargaming is a form of wargaming where units on the battlefield are represented by miniature models, as opposed to abstract pieces such as wooden blocks or plastic counters. Likewise, the battlefield itself is represented by model terrain, as opposed to a flat board or map. Miniature wargaming tends to be more expensive and time-consuming than other forms of wargaming. The models tend to be expensive, particularly when they have a distinctive copyrighted design, such as models made by Games Workshop. Furthermore, most manufacturers do not sell ready-to-play models, they sell boxes of model parts, which the players are expected to assemble and paint themselves. This is requires skill, time, and more money, but many players actually prefer it this way because it gives them a way to show off their artistic skill. Miniature wargaming is as much about artistry as it is about play. A board wargame is played on a board that has a more-or-less fixed layout and is supplied by the game's manufacturer. This is in contrast to customizable playing fields made with modular components, such as in miniature wargaming. A game of Julius Caesar from Columbia Games shows how a player may only know the strength and unit type of their own forces, creating a fog of war element that does not exist in most wargames. In block wargaming, the Fog of War is built into the game by representing units with upright wooden blocks that are marked on only one face, which is oriented towards the player who owns the block. The opponent cannot see the markings from his position. The first such block wargame was Quebec 1759 by Columbia Games (previously named Gamma Two Games), depicting the campaign surrounding the Battle of the Plains of Abraham. Because of their nature, cards are well suited for abstract games, as opposed to the simulation aspects of wargames. Traditional card games are not considered wargames even when nominally about the same subject (such as the game War). An early card wargame was Nuclear War, a 'tongue-in-cheek game of the end of the world', first published in 1966 and still published today by Flying Buffalo. It does not simulate how any actual nuclear exchange would happen, but it is still structured unlike most card games because of the way it deals with its subject. In the late 1970s Battleline Publications (a board wargame company) produced two card games, Naval War and Armor Supremacy. The first was fairly popular in wargaming circles, and is a light system of naval combat, though again not depicting any 'real' situation (players may operate ships from opposing navies side-by-side). Armor Supremacy was not as successful, but is a look at the constant design and development of new types of tanks during World War II. The most successful card wargame (as a card game and as a wargame) would almost certainly be Up Front, a card game about tactical combat in World War II published by Avalon Hill in 1983. The abstractness is harnessed in the game by having the deck produce random terrain, and chances to fire, and the like, simulating uncertainty as to the local conditions (nature of the terrain, etc.). Dan Verssen Games is a specialist designer and publisher of card games for several genres, including air combat and World War II and Modern land combat. Also, card driven games (CDGs), first introduced in 1993, use a deck of (custom) cards to drive most elements of the game, such as unit movement (activation) and random events. These are, however, distinctly board games, the deck is merely one of the most important elements of the game. The term "wargame" is rarely used in the video gaming hobby. Most strategy video games depict realistic (or semi-realistic) scenarios of war anyway, so computer wargames are usually just called "strategy games". If a strategy video game is especially realistic, they are often called "simulations". Computer wargames have many advantages over traditional wargames. In a computer game, all the routine procedures and calculations are automated. The player needs only to make strategic and tactical decisions. The learning curve for the player is smaller, as he doesn't have to master all the mechanics of the game. The gameplay is faster, as a computer can process calculations much faster than a human. Computer wargames often have more sophisticated mechanics than traditional wargames thanks to automation. Computer games tend to be cheaper than traditional wargames because, being software, they can be copied and distributed very efficiently. It's easier for a player to find opponents with a computer game: a computer game can use artificial intelligence to provide a virtual opponent, or connect him to another human player over the Internet. For these reasons, computers are now the dominant medium for wargaming. In the recent years, programs have been developed for computer-assisted gaming as regards to wargaming. Two different categories can be distinguished: local computer assisted wargames and remote computer assisted wargames. Local computer assisted wargames are mostly not designed toward recreating the battlefield inside computer memory, but employing the computer to play the role of game master by storing game rules and unit characteristics, tracking unit status and positions or distances, animating the game with sounds and voice and resolving combat. Flow of play is simple: each turn, the units come up in a random order. Therefore, the more units an opponent has, the more chance he will be selected for the next turn. When a unit comes up, the commander specifies an order and if offensive action is being taken, a target, along with details about distance. The results of the order, base move distance and effect to target, are reported, and the unit is moved on the tabletop. All distance relationships are tracked on the tabletop. All record-keeping is tracked by the computer. Remote computer assisted wargames can be considered as extensions to the concept of play-by-email gaming, however the presentation and actual capabilities are completely different. They have been designed to replicate the look and feel of existing board or miniatures wargames on the computer. The map and counters are presented to the user who can then manipulate these, more-or-less as if he were playing the physical game, and send a saved file off to his opponent, who can review what has been done without having to duplicate everything on his physical set-up of the game, and respond. Some allow for both players to get on-line and see each other's moves in real-time. These systems are generally set up so that while one can play the game, the program has no knowledge of the rules, and cannot enforce them. The human players must have a knowledge of the rules themselves. The idea is to promote the playing of the games (by making play against a remote opponent easier), while supporting the industry (and reducing copyright issues) by ensuring that the players have access to the actual physical game. The four main programs that can be used to play a number of games each are Aide de Camp, Cyberboard, Vassal and ZunTzu. Aide de Camp is available for purchase, while the other three are offered free. Vassal is in turn an outgrowth of the VASL (Virtual ASL) project, and uses Java, making it accessible to any computer that can run a modern JVM, while the other three are Microsoft Windows programs. Wargames were played remotely through the mail, with players sending lists of moves, or orders, to each other through the mail. In some early PBM systems, six sided dice rolling was simulated by designating a specific stock and a future date and once that date passed, the players would determine an actions outcome using the sales in hundreds value for specific stocks on a specific date and then dividing the NYSE published sales in hundreds by six, using the remainder as the dice result. Nuclear Destruction, by the Flying Buffalo, was an early PBM game in 1970. Origins Award Hall-of-Fame member Middle-Earth Play-By-Mail is still active today. Reality Simulations, Inc. still runs a number of PBM games, such as Duel2 (formerly known as Duelmasters), Hyborian War, and Forgotten Realms: War of the Avatars. Since e-mail is faster than the standard postal service, the rise of the Internet saw a shift of people playing board wargames from play-by-mail (PBM) to play-by-email (PBEM) or play-by-web (PBW). The mechanics were the same, merely the medium was faster. At this time, turn-based strategy computer games still had a decent amount of popularity, and many started explicitly supporting the sending of saved-game files through email (instead of needing to find the file to send to the opponent by hand). As with all types of video games, the rise in home networking solutions and Internet access has also meant that networked games are now common and easy to set up. The playing field and pieces from Hellwig's wargame. The first wargame was invented in Prussia in 1780 by Johann Christian Ludwig Hellwig, who was a college professor in Brunswick. Hellwing wanted to design a game by which he could teach some principles of warfare to his students, many of whom were noblemen destined for military service, but he also wanted his game to be fun and accessible to those who were not destined for the military. Hellwig chose to base his game on chess, believing that this would attract chess players and make it easier for them to learn. Hellwig published a second edition of his rulebook in 1803. As in chess, Hellwig's game was played on a grid of squares, but it was a much larger grid, and the squares were color-coded to represent different types of terrain: mountains, swamp, water, trenches, etc. The layout of the terrain was not fixed, which allowed players to create their own custom battlefields. The pieces in the game represented real military units: cavalry, infantry, artillery, and various support units. As in chess, only a single piece could occupy a square, and the pieces moved square by square, either laterally or diagonally. Over normal terrain, infantry could move a maximum distance of eight squares, dragoons could move twelve squares, and light cavalry could move sixteen squares — intuitively mirroring the speed at which these units move in the real world. But terrain could impede movement: mountains were impassable, swamps slowed units down, rivers could only be crossed with the help of a special pontoon unit, etc. A player could only move one piece per turn, or one group of pieces if they were arranged in a rectangle. A piece could capture an enemy piece by moving into its square, just like in chess, but infantry and artillery pieces could also shoot enemy pieces, at a maximum ranges of two to three squares. Unlike chess, the pieces had orientation: for instance, an infantry piece could only shoot an enemy piece if they were facing it and flanking it. Hellwig's wargame was a great success, and inspired other inventors to develop their own chess-like wargames. In 1796, another Prussian named Johann Georg Julius Venturini invented his own wargame, inspired by Hellwig's game. Venturini's game was played on an even larger grid. Venturini's game also added rules governing logistics, such as supply convoys and mobile bakeries, and the effects of weather and seasons, making this perhaps the first operational-level wargame. In 1806, an Austrian named Johann Ferdinand Opiz developed a wargame aimed at both civilian and military markets. Like Hellwig's game, it used a modular grid-based board. But unlike Hellwig's game, Opiz's game used dice rolls to simulate the unpredictability of real warfare. This innovation was controversial at the time. Hellwig, who designed his wargame for both leisure as well as instruction, felt that introducing chance would spoil the fun. A criticism of the wargames of Hellwig, Venturini, and Opiz was that the pieces moved across a grid in chess-like fashion: only a single piece could occupy a square, even if that square represented a square mile, and the pieces had to move square by square. This, of course, did not reflect how real troops in the field actually moved. In response to this criticism, a Prussian nobleman named George Leopold von Reisswitz developed a more realistic wargame wherein the units could move about the battlefield in a free-form manner. The king of Prussia heard of Reisswitz's project and invited him to demonstrate it at the palace. In early 1812, Reisswitz presented to the king an elaborate apparatus that came in the form of a wooden table-cabinet, and shortly afterwards Reisswitz published a book describing his game. The game's materials were stored in the cabinet's drawers. The battlefield was made of porcelain tiles laid out on the cabinet's top. The tiles displayed painted bas-relief images of various terrain types (rivers, roads, marshes, hills, etc.). They were modular, and so they could be arranged to create a custom battlefield. The game pieces were little porcelain blocks, each representing a troop formation. The pieces could move about the battlefield in free-form manner. The players used wooden dividers to measure the distances pieces could move. The royal family loved Reisswitz's game and played it frequently. However, it was not adopted by army instructors nor sold commercially. Reisswitz never perfected his wargame, largely because he was distracted by the upheavals caused by the Napoleonic Wars. By 1816, Reisswitz seemed to have lost interest in wargaming altogether. The development of the wargame was continued by his son, Georg Heinrich Rudolf Johann von Reisswitz, who was a junior officer in the Prussian army. A reconstruction of the wargame developed in 1824 by Reisswitz Jr.
Reisswitz's son, Georg Heinrich Rudolf Johann von Reisswitz, perfected his father's wargame and presented it to the Prussian king and General Staff in 1824. In the earlier wargames of Hellwig and Venturini, units were like chess pieces in that when attacked, they were simply killed and removed from play, even though the pieces represented groups of soldiers. By contrast, units in Reisswitz's game could suffer partial losses yet still remain on the battlefield. A unit might withstand several rounds' worth of enemy attacks before finally collapsing. Reisswitz's game was thus the first to incorporate unit hitpoints. It also modeled variable damage: The casualties inflicted varied according to the type of unit making the attack, its distance, and the roll of a dice. Earlier wargames had a fixed victory condition, such as occupying the enemy's fortress in the case of Hellwig. By contrast, Reisswitz's wargame was more open-ended. The objectives that a player might pursue could vary from one game to the next and generally resembled what objectives a real general in the field might pursue. Whereas Reisswitz Sr.'s game was played on an arrangement of modular terrain tiles, Reisswitz Jr.'s game was played on a paper map. The Prussian army had recently begun using highly accurate topographical maps, which were the product of new advances in cartography and printing. These maps may have not been available to Reisswitz Sr., but they were available by the 1820s and Reisswitz Jr. took advantage of them. This allowed for more natural terrain and the ability to simulate battles in real locations. The troop blocks were made to reflect the dimensions of the troop formations they represented to the same scale as the game map, such that each block occupied the same proportional space that the real formation would occupy in the field. Reisswitz Jr.'s wargame was thus the first to use an absolute scale. Reisswitz Jr.'s most significant innovation was the introduction of an umpire. The players did not directly control the pieces on the game map. Rather, they wrote orders for their troops on pieces of paper, which they gave to the umpire. The umpire then moved the pieces across the game map according to how he judged the imaginary troops would interpret and carry out the players' orders. When the troops engaged the enemy on the map, it was umpire who rolled the dice, computed the effects, and removed defeated units from map. The umpire also managed secret information so as to simulate the fog of war. The umpire placed pieces on the map only for those units which he judged both sides could see. The umpire kept a mental track of where the hidden units were, and only placed their pieces when they came into view of the enemy. The Prussian royal family and the General Staff officially endorsed Reisswitz Jr.'s wargame, and Reisswitz Jr. established a workshop by which he could mass-produce and distribute it. It was widely played by the officer corps, and a number of wargaming clubs formed. This was thus the first wargame to be widely adopted by a military as a serious tool for training and research. Reisswitz Jr. died in 1827, but Prussian officers continued to practice wargaming, and over the years they developed new variations of Reisswitz's system to incorporate new military technologies and tactics. Prussian wargaming attracted little attention outside Prussia until 1870, when Prussia defeated France in the Franco-Prussian War. Many credited Prussia's victory to its wargaming tradition, and this led to great worldwide interest. Civilians and military forces around the world now took a keen interest in the German military wargames, which foreigners referred to as kriegsspiel (the German word for "wargame"). The first kriegsspiel manual in English, based on the system of Wilhelm von Tschischwitz, was published in 1872 for the British army and received a royal endorsement. The world's first recreational wargaming club was the University Kriegspiel [sic] Club, founded in 1873 at Oxford University in England. In the United States, Charles Adiel Lewis Totten published Strategos, the American War Game in 1880, and William R. Livermore published The American Kriegsspiel in 1882, both heavily inspired by Prussian wargames. In 1894, the US Naval War College made wargaming a regular tool of instruction. In 1881, the Scottish writer Robert Louis Stevenson became the first documented person to use toy soldiers in a wargame, and thus he might be the inventor of miniature wargaming. However, in his game, each toy soldier was used to represent an entire unit rather than an individual, and his playing field was just a chalk map drawn on the floor. Stevenson never published his rules, but according to an account by his stepson, they were very sophisticated and realistic, on par with German military wargames. In 1898, the British writer Fred T. Jane published the first rulebook for a naval wargame: Rules for the Jane Naval War Game. Jane's wargame was also the first published wargame to use miniature models. It used scale models of warships made out of cork and wires; the wires were used for guns and masts. Jane's rulebook described in great detail the capabilities of the warships, such as the range and armor-penetrating power of the guns. It also simulated localized damage, such as what would happen to a warship if its boiler was damaged, or its gun battery. H. G. Wells and his friends playing Little Wars. 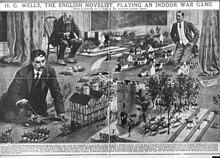 The English writer H. G. Wells developed his own codified rules for playing with toy soldiers, which he published in a book titled Little Wars (1913). This is widely remembered as the first rulebook for miniature wargaming (for terrestrial armies, at least). Little Wars had very simple rules to make it fun and accessible to anyone. Little Wars did not use dice or computation to resolve fights. For artillery attacks, players used spring-loaded toy cannons which fired little wooden cylinders to physically knock over enemy models. As for infantry and cavalry, they could only engage in hand-to-hand combat (even if the figurines exhibited firearms). When two infantry units fought in close quarters, the units would suffer non-random losses determined by their relative sizes. Little Wars was designed for a large field of play, such as a lawn or the floor of a large room. An infantryman could move up to one foot per turn, and a cavalryman could move up to two feet per turn. To measure these distances, players used a two-foot long piece of string. Wells was also the first wargamer to use scale models of buildings, trees, and other terrain features to create a three-dimensional battlefield. Wells' rulebook failed to invigorate the miniature wargaming community. A possible reason was the two World Wars, which de-glamorized war and caused shortages of tin and lead that made model soldiers expensive. Another reason may have been the lack of magazines or clubs dedicated to miniature wargames. Miniature wargaming was seen as a niche within the larger hobby of making and collecting model soldiers. In 1955, a California man named Jack Scruby began making inexpensive miniature models for miniature wargames out of type metal. Scruby's major contribution to the miniature wargaming hobby was to network players across America and the UK. At the time, the miniature wargaming community was miniscule, and players struggled to find each other. In 1956, Scruby organized the first miniature wargaming convention in America, which was attended by just fourteen people. From 1957 to 1962, he self-published the world's first wargaming magazine, titled The War Game Digest, through which wargamers could publish their rules and share game reports. It had less than two hundred subscribers, but it did establish a community that kept growing. Around the same time in the United Kingdom, Donald Featherstone began writing an influential series of books on wargaming, which represented the first mainstream published contribution to wargaming since Little Wars. Titles included : War Games (1962), Advanced Wargames, Solo Wargaming, Wargame Campaigns, Battles with Model Tanks, Skirmish Wargaming. Such was the popularity of such titles that other authors were able to have published wargaming titles. This output of published wargaming titles from British authors coupled with the emergence at the same time of several manufacturers providing suitable wargame miniatures (e.g. Miniature Figurines, Hinchliffe, Peter Laing, Garrisson, Skytrex, Davco, Heroic & Ros) was responsible for the huge upsurge of popularity of the hobby in the late 1960s and into the 1970s. In 1956, Tony Bath published what was the first ruleset for a miniature wargame set in the medieval period. These rules were a major inspiration for Gary Gygax's Chainmail (1971). From 1983 to 2010, Games Workshop produced what was the first miniature wargame designed to be used with proprietary models: Warhammer Fantasy. Earlier miniature wargames were designed to be played using generic models that could be bought from any manufacturer, but Warhammer Fantasy's setting featured original characters with distinctive visual designs, and their models were produced exclusively by Games Workshop. Tactics (1954) was the first successful board wargame. The first successful commercial board wargame was Tactics (1954) by an American named Charles S. Roberts. What distinguished this wargame from previous ones is that it was mass-produced and all the necessary materials for play were bundled together in a box. Previous wargames were often just a rulebook and required players to obtain the other materials themselves. The game was played on a pre-fabricated board with a fixed layout, which is why it was called a board game. Roberts later founded the Avalon Hill Game Company, the first firm that specialized in commercial wargames. In 1958, Avalon Hill released Gettysburg, which was a retooling of the rules of Tactics, and was based on the historical Battle of Gettysburg. Gettysburg became the most widely-played wargame yet. Board wargames were more popular than miniature wargames. One reason was that assembling a playset for miniature wargaming was expensive, time-consuming, and require artisanal skill. Another reason was that board wargames could be played by correspondence. Board wargames were usually grid-based, or else designed in some way that moves could be explained in writing in simple terms. This was not possible with the free-form nature of miniature wargames. The US military was the first to use electronic computers to assist in wargaming. Computers in this era were very expensive, the purview of governments and large corporations. Beginning in the 1950s, the RAND Corporation developed a number of wargames for the US military. The advent of nuclear weapons and the Cold War created a need for wargames to simulate the political and economic dimensions of war. The wargaming hobby declined in the 1980s. One factor was competition from role-playing games such as Dungeons and Dragons: the sort of person who would have gone into wargaming instead went into RPGs. A second factor was the rise of affordable and powerful personal computers and gaming consoles. Computer wargames were easier to learn and faster to play because the routine procedures and arithmetic were automated. Don Featherstone – Known in the UK as the "co-father" of modern miniature wargaming. Charles S. Roberts – Known as the "Father of modern board wargaming", designed the first modern wargame, as well as the company most identified with modern wargames (Avalon Hill). Richard Berg – Designer of Terrible Swift Sword, and worked at SPI. Frank Chadwick – A co-founder of Game Designers Workshop (along with Loren Wiseman, Marc Miller, and Rich Banner), one of the first major competitors to Avalon Hill, and himself a prolific wargame designer and innovator. Jim Dunnigan – considered "The Dean of Modern Wargaming", founder of SPI and the most prolific print wargame designer in history. His designs included many firsts in wargaming, including the first tactical wargames. Charles Grant – Author of The Wargame. Laurence Groves – Founded Martial Enterprises and designed La Bataille de la Moscowa (1974), recognized as the first "monster game." Died in the late 1970s in a motorcycle accident. E. Gary Gygax – Designer of several miniatures and board wargames who went on to co-create (with Dave Arneson) and publish Dungeons & Dragons. Larry Harris – Designer of Axis and Allies, Conquest of the Empire, and other games in the Axis and Allies Series. Bruce Quarrie – wrote rule sets for Napoleonic and World War II wargames and also on military history. Mark Herman – Member of the "Hall of Fame" and designer of We The People, the first Card Driven Wargame; worked originally at SPI and was the CEO of VG. Most recent designs are For The People and Empire of the Sun, each of which won the Charles S. Roberts Award for best game in their category. John Hill – Designer of Squad Leader, Johnny Reb, and other well-received designs. David Manley – author of "Iron and Fire", "Fox Two" and other air and naval rules systems, editor of the Naval Wargames Society journal "Battlefleet"
Redmond Simonsen – Co-founder of SPI and introduced many advanced graphics design elements to wargame designs. Richard Thomas Bailey - Designer and founder of www.Tinywargames.com and designer of boardgames such as Bullet. Diplomacy – (1954) a classic multi-player game from the "golden age" of wargames in which strategy is exercised off the game board as well as on it. Tactical Game 3 (Strategy & Tactics Magazine game, 1969); re-released as PanzerBlitz by Avalon Hill in 1970. The very first tactical wargame. The game pioneered the use of "geomorphic mapboards" and PanzerBlitz was a game system rather than just a game in that forces could be used to depict any number of actual tactical situations rather than one specific scenario. Pioneered several ground-breaking features, such as use of various types of weapons fire to reflect battlefield conditions. Also created new level of realism in reflecting tactical armored vehicles. Rise and Decline of the Third Reich (Avalon Hill, 1974) – The first serious attempt to model World War II in Europe in its entirety, including (in a limited way) the economic and industrial production of the nations involved. It has seen numerous versions and editions, and is currently available as John Prados' Third Reich from Avalanche Press, and as a far more complex descendant game, A World At War, published by GMT Games. Squad Leader (Avalon Hill, 1977) and Advanced Squad Leader (1985) have become the most prolific series of wargames, including 3 add-on modules for the former, and 12 for the latter, with additional Historical modules and Deluxe modules also having been released. ASL also sets the record for sheer volume of playing components, with thousands of official counters and 60+ "geomorphic mapboards" not counting Deluxe and Historical maps. Storm Over Arnhem (Avalon Hill, 1981) – pioneered the use of "point to point" or "area movement" in tactical wargames. Axis and Allies – (Nova Games, 1981) the most successful of Milton Bradley's (1984) 'GameMaster' line in an attempt to bring wargaming into the mainstream by appealing to non-wargamers through simplicity and attractive components. Rules for the Jane Naval War Game (S. Low, Marston, 1898) – The first published miniature wargame. A 26-page rule set limited to naval miniature battles. It came in a crate measuring 4 ft. X 4 ft. X 2 ft. Written by Fred Jane. As only a handful of these games survive, they are highly collectible. Little Wars (H.G. Wells, 1913) – The first popular published wargame rules. Includes the common miniature wargaming mechanics of dice rolling, range, line of sight, and moving in alternate turns. This game earned Wells the title "The Father of Miniature Wargaming". Miniature Wargames du temps de Napoleon (John C. Candler, 1964) – First period-specific historical miniature wargame. Also the first in a long line of Napoleonic miniature wargames. Chainmail (Guidon Games, 1971) – An extension and distillation of rules previously published in various periodicals. While mostly about historical medieval combat, it had an addendum that covered fantasy elements. Major elements of this game were adopted by the role-playing game Dungeons & Dragons. Unlike Dungeons & Dragons, Chainmail used two six-sided dice to resolve combat. Previous fantasy miniature wargames had been written, but this was the first one published. Drawing on the popularity of The Lord of the Rings, this game featured the novelties of combat magic and fantastic creatures as combatants. Warmachine (Privateer Press, 2003) – A steampunk-inspired miniatures game featuring steam-powered robots fighting under the direction of powerful wizards. Also has a sister game, Hordes, which features large monstrous creatures in the place of robots. Infinity (Corvus Belli, 2005) is a tabletop wargame in which sci-fi themed with 28mm scale metal miniatures are used to simulate futuristic skirmishes. Infinity is a groundbreaking, dynamic system that allows you to make meaningful, fun choices throughout the entire game sequence, and gives you the tools to implement any number of strategies with realism and flexibility. See also List of miniature wargames. Panzer General – (Strategic Simulations, Inc., 1994) – probably the most widely popular computer game that is recognizably a traditional wargame. It spawned several sequels, some of which explored different subject matter. Steel Panthers – (Strategic Simulations, Inc., 1995) – an early tactical wargame on the same scale as Squad Leader, which led to two sequels, and a complete revision of the title for free release. Close Combat – (Microsoft, 1996) – not the first wargame to break out from hexes, and still presented in a 2-dimensional format, Close Combat nonetheless uniquely addressed factors such as individual morale and reluctance to carry out orders. The original title led to 5 very successful sequels for the general public, as well as being developed into a training tool for military use only. Close Combat stemmed from an early attempt to translate the Squad Leader boardgame to the computer. Combat Mission – (Big Time Software, 2000) – not the first 3D tactical wargame (titles such as Muzzle Velocity preceded it), but a groundbreaking game series featuring simultaneous order resolution, complete orders of battle for numerous nationalities, with three titles based on the original game engine. As of 2006, a campaign layer is in testing as well as a revised game engine to be released before 2007. CM's genesis was also as a failed attempt by Avalon Hill to translate Squad Leader to the computer. TacOps – (Major I.L. Holdridge, 2003 for v4) – commercial version of “TacOpsCav 4”, an officially issued standard training device of the US Army. It is a simulation of contemporary and near-future tactical, ground, combat between the modern armed forces of the world. Wargame: Red Dragon – (Eugen Systems, 2014) – a 3D regiment or brigade scale simulation set as a "Cold War Gone Hot" themed game in both multiplayer and singleplayer environments. Players construct customized armies through use of a deck system comprising land vehicles, infantry, and helicopters from several NATO and Warsaw Pact nations and manage logistics such as fuel and ammunition while on the battlefield. There is no cohesive campaign, the game instead taking place in several hypothetical conflicts. Hearts of Iron (series) – (Paradox Interactive) − a grand strategy wargame series that is focused on World War 2. Player may act as any reasonably sized nation at the time, influencing international politics, economic and military development, and can control battlefields on both strategic and operational levels using combined arms. Frequently used to entertain and simulate alternative history scenarios as well as recreate historical events. Ace of Aces – (Nova Games, 1980) – this flip-book system has long been considered[by whom?] one of the best simulations of aerial dogfighting. BattleTech – (FASA, 1984) – initially conceived as a board game, it has created a brand that now includes various different boardgames (tactical as well as strategic), miniature game rules, a role-playing game, computer games, flip-book games (by Nova Games) as well as novels and a TV series. Car Wars – (Steve Jackson Games, 1982) – initially printed as a board game, it quickly evolved to incorporate elements of miniatures games. Up Front – (Avalon Hill, 1983) – the most popular of the very small class of card wargames. ^ Approximate. Miniature wargames typically express their scales in terms of the height of a human figurine in millimeters. 1:64 roughly corresponds to 28mm, and 1:120 to 15mm. ^ An M1 Garand has an effective range of 457m, which corresponds to 3.8m at a scale of 1:120. "The [U.S. Naval War College’s War Gaming Department] uses the Perla (1990) definition, which describes war gaming as “. . . a warfare model or simulation whose operation does not involve the activities of actual military forces, and whose sequence of events affects and is, in turn, affected by the decisions made by players representing the opposing sides” (Perla, 1990, p. 164). By doing so, this differentiates a war game from a training exercise, which uses real forces." ^ Perla (1990): "[Wargames] are of little use in providing rigorous, quantitative measures to "objectively" prove or disprove technical or tactical theories." ^ Admiral Thomas B. Hayward (US Navy), in a foreword to Perla (1990): "It is my conviction that wargaming as a training tool constitutes the overriding value of the wargaming technique, whether tactical or strategic. I would almost go so far as to say the only value. For I contend that using the wargame beyond the training dimension is fraught with flotsam that endangers the utility of the outcome unless managed with great care by the experts." "A real wargame must have human players whose decision affect and are affected by the flow of game events." ^ Peterson (2012): "Unlike abstract games of strategy, all wargames have a setting, which determines the armaments of the combatants and the environment in which they deploy." "A player's decision level is strategic if his responsibility extends to allocating resources, possibly including economic and political resources as well as military forces, to fight and win an entire war. A player is making tactical-level decisions if he is most concerned about positioning relatively small numbers of men and weapons to apply violence directly to the enemy; that is, to fight battles." "A player's decision level is strategic if his responsibility extends to allocating resources, possibly including economic and political resources as well as military forces, to fight and win an entire war. A player is making tactical-level decisions if he is most concerned about positioning relatively small numbers of men and weapons to apply violence directly to the enemy; that is, to fight battles. The operational level game is less easily described; here the player is concerned with maneuvering relatively large forces so that they can be positioned to win the battles they fight, and so that those battles can help win the war. In the sense of decision making, then, the level of the game reflects the scope of the players' decisions." ^ James Johnson (30 June 2014). "The "Four Levels" of Wargaming: A New Scope on the Hobby". www.beastsofwar.com. ^ Lawrence J. Dondero; et al. (1966). Tacspiel War-Game Procedures and Rules of Play for Guerrilla/Counterguerrilla Operations [RAC-TP-223] (PDF). Research Analysis Corporation. "...the discretion of the umpire may be subject to all manner of conscious or unconscious bias." "To the avid miniature wargamer, board gaming must have appeared crude, aesthetically dull and confining in the rigidity of its rules; to the unrepentant board wargamer, miniature gaming looked expensive, labor-intensive and contentious in its latitude toward system." "The first thought which presented itself to my mind was that the learning of my game ought not to be burdened with too many details if it was to fulfill its mission. I judged from the first that I should achieve my object in the quickest way if I took for its basis the game of chess, in favor with so many distinguished persons of all ranks. My idea was to adapt, as far as possible, the game of chess to my own game, in order so to interest amateurs that they would at least give mine a trial. [...] experience confirmed the wisdom of my expectations, for chess players were the first to welcome my invention [...]"
"Infantry and artillery units may discharge their firearms instead of advancing on an enemy; if an infantry unit destroys an enemy with gunfire, that enemy is removed from the board but the infantry unit does not advance to occupy the vacated position. The efficacy of rifles rests largely on the orientation of the opposing unit: infantry units facing one another enjoy effectively immunity to one another’s gunfire, so only flanking fire had an effect." "Although Venturini replaced the wargame board with a map, he still imposed a one-inch square grid over that map, and he imagined each square of the grid to be two thousand paces (Schritte) across, which if we assume a German military pace of rough thirty inches, means his game employs a scale around 1:60,000, or a bit shy of one mile per square." ^ Peterson (2012): "Venturini increases the variety of terrain, takes into account seasons and weather, vastly increases the sorts of entrenchments and fortifications that combatants might construct, and adds significant, but not necessarily exciting, detail to the feeding, equipping and support of forces in the field." trans. :"A secondary intention was to give a pleasant entertainment to a person who did not need such instruction through a game in which nothing depends on chance but on the direction of the player." "...the grid imposed on the wargames of Hellwig and Venturini significantly limited the capacity of these systems to represent the position of troops realistically. Effectively, in a board wargame divided into squares of a scale mile across, there is only one position that troops within a mile’s range could hold. [...] Reiswitz began to experiment with games played on model spaces without grids." ^ The foreword of Reiswtiz's 1812 rulebook was dated 19 March 1812. The rulebook was published after he presented his game to the king. "Reiswitz subsequently published two hundred copies of a formal account of his wargame in Berlin under the title Taktisches Kriegs-Spiel oder Anleitung zu einer mechanischen Vorrichtung um taktische Manoeuvres sinnlich darzustellen (1812, “Tactical Wargame, or instructions for a mechanical device to show realistic tactical maneuvers”)." "It was in the shape of a large table open at the top for the terrain pieces to fit into. The terrain pieces were 3 to 4 inches square, and the overall area was at least six feet square. The small squares could be re-arranged so that a multiplicity of landscape was possible. The terrain was made in plaster and was colored to show roads, villages, swamps, rivers, etc. In addition there were dividers for measuring distances, rulers, small boxes for placing over areas so that troops who were unobserved might make surprise attacks, and written rules which were at this stage not yet in their fuller form. The pieces to represent the troops were made of porcelain. The whole thing was extremely well painted." trans. :These types are quadrilateral and represent either a square whose side is 500 feet long, or a rectangle whose longer side is 500, whose shorter is 250 feet long, or a square whose sides are 250 feet long. By this measure they are divided into whole, half and quarter types. A board comprising in length 20 types and in width 15 types, thus containing in aggregate 300 types, is equal to 18,750,000 square-paces or 1/7 square-miles. By determining the scale of the terrain, at the same time, a means of suspension has been given more to measure the movements of the figures; a movement of the length of a whole type is equal to 500 feet or 250 paces. A movement on the diagonal of the whole type is equal to 350 paces or 700 feet." trans. :"§3 To represent these various lines of movement quickly and surely, after several attempts it seemed most convenient to make use of a wooden divider with a light brass thread, which on one foot has a movable arm on which the measure is drawn, and which mediate of a row of teeth separated by fifty-fifty steps, is placed in a pin situated at the other foot, and then determines the width of the opening of the divider, and fixed so that it is very easy to indicate the point from whence emanating from the stone, and to where he can move. §4 If you use this divider, you put a point on the front of the cube on which the playing figure is drawn, close, and determine with the other point the point where this movement is to be directed." "The elder Reiswitz’s interests seem to have drifted away from kriegsspiel after the standalone publication of his history of wargaming (Literärisch-kritische Nachrichten über die Kriegsspiele der Alten und Neuern, 1816), so his son assumed charge over the ongoing development of the game." ^ Reisswitz Jr. (1824): "Few, and entirely incomplete terrain maps had been published, and even those, with a few exceptions such as the 1:10,000 maps of Saxony, did not give terrain in a large enough scale to allow smaller units to be properly represented." "In addition to establishing the general idea and the composition of the opposing forces, the umpire serves as an intermediary for virtually all actions in the game: all movements, all communications and all attacks channel through the umpire, in writing. The players transmit written orders, authored to their units in the persona of a commander, and for the most part the umpire enjoys significant leeway in deciding how these orders will be interpreted." "To convert this to a mass-market venture, the younger Reiswitz organized a workshop to manufacture the game, which included a tin foundry, painters and carpenters, as well as the support of the Royal Lithographic Institute to manufacture maps of the appropriate scale." "In the aftermath of the 1870-1871 Franco-Prussian War, European and world military opinion suddenly became enamored of things German, including Kriegsspiel, to the use of which many experts attributed the German victories." "It seems that neither the British nor the Americans ever quite accepted the full range of wargaming's potential value prior to the end of World War II. [...] The single, and stellar, exception to this assessment is the development and application of wargaming at the U.S. Naval War College. [...] In 1894, under newly appointed President Captain Henry Taylor, gaming became an integral and permanent part of the course of study for all students." ^ Robert Louis Stevenson; Lloyd Osbourne (Dec 1898). "Stevenson at Play (With an Introduction by Lloyd Osbourne)". Scribner's Magazine. Vol. 24 no. 6. pp. 709–719. ^ "Make It Do – Metal Shortages During World War II". www.sarahsundin.com. 11 July 2011. ^ "History of the British Model Soldier Society". www.bmssonline.com. ^ See James Dunnigan's Foreword to Donald Featherstone's Lost Tales, published 2009. Dunnigan clearly places Featherstone in his role as a key propagator of wargaming as a hobby and tool for professionals. "Unlike many earlier war games for the home, which amounted to little more than a set of rules and the occasional map, Tactics came with all the miniature tanks, infantry, and planes need to play in its box." ^ Phil, Barker. "Wargames Research Group". WRG. Retrieved 7 September 2013. Phillip von Hilgers (2000). "Eine Anleitung zur Anleitung. Das Takstische Kriegsspiel 1812-1824" (PDF). Board Games Studies: International Journal For the Study of Board Games (in German) (3): 59–78. George Leopold von Reiswitz (1812). Taktisches Kriegs-Spiel oder Anleitung zu einer mechanischen Vorrichtung um taktische Manoeuvres sinnlich darzustellen [Tactical War Game - or, instruction to a mechanical device to simulate tactical maneuvers]. Gädicke. Peter P. Perla (2012) [1st pub. 1990]. John Curry (ed.). Peter Perla's The Art of Wargaming: A Guide for Professionals and Hobbyists. The History of Wargaming Project. ISBN 978-1-4716-2242-7. H. G. Wells (1913). Little Wars. Paul Schuurman (2017). "Models of war 1770–1830: the birth of wargames and the trade-off between realism and simplicity". History of European Ideas. 43 (5): 442–455. doi:10.1080/01916599.2017.1366928. Retrieved 2018-10-27. Michael J. Tresca (2011). The Evolution of Fantasy Role-Playing Games. McFarland. ISBN 9780786460090. Pat Harrigan; Matthew G. Kirschenbaum, eds. (2016). Zones of Control: Perspectives on Wargaming. MIT Press. ISBN 9780262033992. Johann Christian Ludwig Hellwig (1803). Das Kriegsspiel [The Wargame]. Tristan Donovan (2017). It's All a Game: The History of Board Games from Monopoly to Settlers of Catan. Macmillan. ISBN 9781250082732. Martin van Creveld (2013). Wargames: From Gladiators to Gigabytes. Cambridge University Press. ISBN 9781107036956. Rolf F. Nohr; Stefan Böhme (2009). Die Auftritte des Krieges sinnlich machen. Appelhans-Verlag Braunschweig. ISBN 978-3-941737-02-0. Rick Priestley; John Lambshead (2016). Tabletop Wargames: A Designers' and Writers' Handbook. Pen & Sword Books Limited. ISBN 9781783831487. Peter P. Perla; Raymond T. Barrett (1985). An Introduction to Wargaming and its Uses (PDF). Shawn Burns, ed. (2013). War Gamers' Handbook: A Guide for Professional War Gamers (PDF). US Naval War College. Jon Peterson (2012). Playing at the World: A History of Simulating Wars, People and Fantastic Adventures, from Chess to Role-playing Games. Unreason Press. ISBN 9780615642048. "Foreign War Games". Selected Professional Papers Translated from European Military Publications. Translated by H. O. S. Heistand. Washington D.C.: US Government Printing Office. 1898. pp. 233–289. Phil Barker Know The Game: War Gaming, EP Publishing 1978. Phil Barker Airfix magazine Guides : Ancient Wargaming, P.Stephens Ltd 1975. Jim Dunnigan, The Complete Wargames Handbook: How to Play, Design, and Find Them, Quill 1992. ISBN 0-688-10368-5 This is available online at hyw.com (verified December 2011). Dorca Bis Alejo, "El Hobby de los soldados en miniatura, el wargame, el rol, el modelismo y el coleccionismo." primera edición: 23 de agosto de 2008, ISBN 99920-1-701-5, 212 p.
Dorca Alejo, "My Toy Soldiers & Me" Second edition. Bruce Quarrie Airfix magazine Guides : Napoleonic Wargaming, P.Stephens Ltd 1974. Philip Sabin: Simulating War. Studying Conflict Simulation through Games, London 2012. Andrew Wilson War Gaming, Penguin 1970. Terence Wise Airfix magazine Guides : American Civil War Wargaming, P.Stephens Ltd 1977. Sport: Little Wars, Time Magazine, December 14, 1942. War games, by Dr. Brett Holman, PhD in History, 5 August 2007. Dice against the Nazis: Propaganda aimed to reduce fear, By Clive Gilbert and Kevin Allen, BBC News Magazine, 24 August 2007. "Return of the hex-crazed wargamers; Is the Net breathing new life into an endangered hobby--or just postponing the inevitable?," by Andrew Leonard, Salon Magazine, May 29, 1998. Gray, Bill (21 September 2016). "Impedimenta: Cardboard Logistics". Wargamer. LaFleur, Col. Thomas. "Wargaming: Training, Educational Tool for the Future" (PDF). Wikimedia Commons has media related to Wargames.